We Know How To Lift Stuff! With the economy in the shape that it is, we may need to spend more time working on our older vehicles in an attempt to keep them going and save us from having to buy a new car. 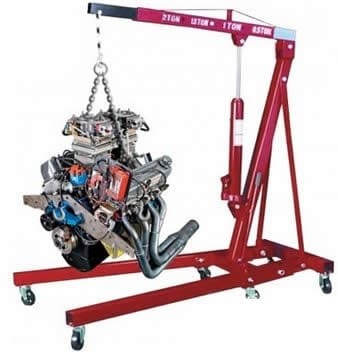 When replacing any automotive or pick up truck engine having a hydraulic engine hoist is an essential part of completing the task safely and efficiently. The use of a hydraulic engine hoist, also called cherry pickers or an engine lift, can make what can be a very dangerous job that could take a week or so into a task that can be done in one weekend. We have all seen the backyard mechanic trying to do this job with chains and pulleys and maybe using an old tree limb as their lift support beam. Using this method can be dicey and time consuming at best and deadly at the very worst. Engine hoist are used every day not only by the do it yourself mechanic they are also an essential part of many professional body shops and automotive repair shops to remove and replace engine blocks and transmissions in a quick and timely manner. These essential tools can be used not only for engine removal and replacement but for any heavy lifting task that may occur in your shop. These units contain an engine hoist hydraulic cylinder that can lift up to 4000 pounds depending on the size of the unit you choose; they may not be powerful enough to lift a vehicle off the ground, like a car lift can, engine hoists do have the power to lift a couple of tons, which means that removing the engine from your car is an easy job. Number one on our best engine hoists list is the Goplus 2 Ton engine lift. The reason why we have rated this lift as our number one choice is because it ticks all of the boxes when it comes to construction, price and customer satisfaction. With a maximum lifting capacity of 4000 lbs, or 2 tons, the GoPlus is capable of lifting the heaviest pickup truck and car engines with ease. Personally, we never like to push a hoist to its maximum capacity, so having a 2 ton max means that its day to day working capacity should easily handle 2000 lbs or 1 ton without breaking sweat. The Goplus crane is constructed from heavy gauge steel which makes it very durable and safe to use. 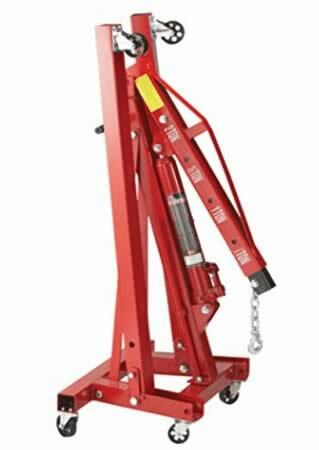 Its solid construction allows for weights of up to 1000 lbs to be lifted when the boom is fully extended, which is great for larger vehicles. The cranes steel has a powder coat finish which makes it corrosion and rust resistant and easy to wipe grease oil off to keep it working for a lifetime of use, both indoors and outdoors. Moving the GoPlus around your garage, or positioning it ready for a lift is a breeze, thanks to its heavy duty castor wheels which can move in 360 degrees. It also has a foldable design, so you can easily store the cherry picker when not in use, which is perfect if you ask me, as workspace in my garage both at home and at work is at a premium. One tip I would give you is to keep the wheels free from grease and any debris they may pick up on your shop floor. You want your wheels to be free moving, especially when it has an engine swinging from the chain. being able to make small movements easily is essential when lowering the engine on to an engine stand or workbench. More DetailsThe GoPlus engine crane has 4 adjustable boom positions, so, depending on how heavy the engine is that you need to remove, or the size of the front of the truck or car, you can get the job done. Depending on which position is selected, the extendable boom can lift ½ ton, 1 ton, 1 and ½ tons or 2 tons, basically, the further it is extended, the less weight it can lift respectively. At the heart of the GoPlus is the 8 ton hydraulic cylinder which performs all of the lifting for you and being rated at 8 tons, it has twice the capacity of the steel construction, so is not going to fail you any time soon. One of the best things about Amazon is that buyers can leave reviews, and I am sure that like me, these help you decide if something is worth buying. With comments from buyers such as ‘Easily Assembled. Appears well made and functioned well. This is a great buy and quality product’ and ‘Bought to remove a 7.4/454 chevy big block from a 6 inch lifted truck had to remove front tires and radiator and on .5 ton setting it hoisted the engine right out no problem’, you can have confidence that what you are getting is a quality lift. The GoPlus is not just a great engine hoist at a great price, but it is also useful for so many things around the garage or workshop and can easily handle loading heavy objects on to trucks or vans or moving them around the garage with minimal effort. Number 2 on our best engine hoists list is engine hoist from Dragway Tools. Although this portable cherry picker costs a bit more than the GoPlus it is still an excellent option which should be considered. The Dragway Tools 2-ton folding hydraulic engine crane is extremely similar to the GoPlus hoist, as they both have a lifting capacity of 4000 lbs and can lift from floor level to 102 inches. Again, as said previously, please note that this is the maximum lifting capacity, so the everyday working capacity is less but it can comfortably lift 2000 lbs all day long, every day. Constructed from heavy gauge steel, the Dragway is a very well made and durable engine hoist. When fully extended, the boom can lift weights of up to 1000 lbs thanks to its heavy duty steel construction, that is plenty strong enough for the vast majority of vehicles. With a powder coat finish, the paint is easy to wipe down and rust and corrosion resistant if you need to use it outdoors. Dragway are so confident in the construction of their engine hoist that it comes with a full 1 year warranty. The Dragway also includes a chain to be used for lifting engines, it is made from forged steel and strong enough to lift the maximum 4 ton capacity. More DetailsWith 6 x 3″ steel castor wheels which move in 360 degrees, the Dragway is extremely portable and easy to move around your garage or workshop. With its foldable design, you can store it out of the way for use when you want, freeing up precious space. More than 80% of buyers on Amazon rate the Dragway Tools portable cherry picker as 5 or 4 stars, leaving comments like ‘Unbelievable. I cant get over how nice this unit is.’, ‘The “Extra” 6 hands I didn’t have’ and ‘Worth every dime, great item. Folds away for easy storage’. 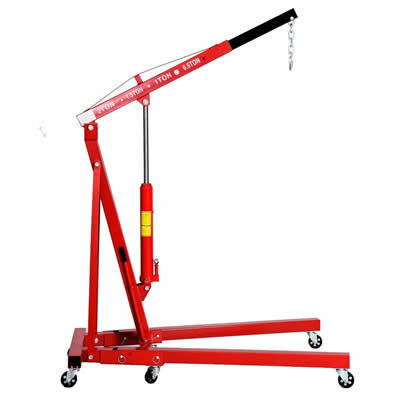 The Dragway 2-ton folding cherry picker is an excellent engine hoist and although it is more expensive than our top pick, it really is worth the little extra as this engine lift will last for a very long time. 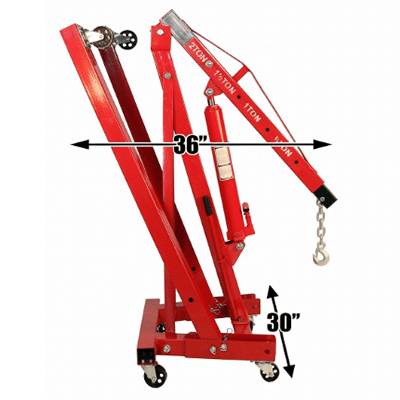 Coming in 3rd on our engine hoist review recommendations list is the Torin Big Red folding cherry picker. With a similar design and functionality to our top two entries, the Torin Big Red engine hoist a quality lift that can handle heavy engines and is built to last. The reason why I have rated this portable engine lift in 3rd is simply down to build quality. Whilst it is still extremely good, it is not up to the same standard as either the GoPlus or Dragway. With its foldable design allowing the Torin to be conveniently stored away when not in use, it is easy to manoeuvre around your garage regardless of if it has a heavy load attached or not. It’s 6 castors move smoothly allowing precision movements, which is just what you need when you are lowering the engine back in to place. The Torin engine lift also has a powder coated finish to its paintwork, which allows for easy and quick wipe down should you drip fluids like oil on it and it is corrosion resistant, meaning it will not rust if you use it outdoors for jobs which require a bit of extra space. It should be noted that the major difference between the Torin and the GoPlus and Dragway is it’s lifting range. Where the previous 2 hoists can lift from the ground to 102 inches, the Torin can only lift from 1 inch above ground level to 78 ¾ inches. The reason I mention this is that for certain vehicles and trucks, you might struggle to get the height needed to lift the engine clear from its housing. More DetailsSo if you are seriously looking at the Torin, make sure it is compatible with the size of the vehicles you want to work on. So what do people who have bought this engine hoist actually think of it, as I have played it down a little? Well, it does not score as well on Amazon, with 73% of customers reading it as 4 or 5 star, but there is quite a bit of love for it. With comments like ‘Much Better Than Expected, Turns out, my old engine hoist was a poor joke compared to this beast.’, ‘Functional engine hoist with minor flaws.’ and ‘Excellent engine hoist’, it certainly seems to do the job. It may not be the best engine hoist on this list but is still a good option which at the right price could be great value for any home amateur mechanic, or for the odd job. If you have the ability to remove and refit an engine, this hoist will save you money, rather than going to a professional mechanic to get the job done for you. You have to be extremely careful as you lift an engine out of a pickup truck or car. Engines are heavy and can weigh between 1/2 – 1 ton, so if you do not take the right precautions and use the right equipment, it could result in some serious harm to your vehicle and potentially yourself if you drop it. The best piece of advice I can give is to find some instructions or manual for your actual vehicle. If you do not have these from when you purchased the car or truck, you should be able to find them online fairly easily. Every automobile has different connections for their engine, and whilst many manufacturers often use the same block, there can be small variances in connectors which you will need to understand before removing the engine. Once you have found all of the connections, you should then disconnect them so the engine is ready for lifting. Use the chain from your cherry picker or a load leveller to attach to the engine block. Very slowly lift the engine from the engine bay. Take it slowly, if there are any issues in how you have fasten the chain to the block, it is better to fall only a few inches then a few feet. Now roll the engine hoist back away from your vehicle to the location you want to work on it, like a workbench or engine stand. An engine stand is the perfect place to work on your engine as it is designed to hold the heavy weight comfortably and stably, whereas a workbench might not be able to hold the weight, and could break causing damage to your engine, workbench and you if you are near it. Just how easy is it to use an engine hoist? Take a look at the video below to watch the right way of doing it. There are some excellent engine hoists available and I hope that the 3 which I have reviewed today help you to find the perfect one for your garage and job. Honestly, you cannot go wrong with any of the portable cherry pickers I have chosen and they will all handle most engines with ease. However, there can only be one winner, and for me, based on the quality of the construction vs the cost, it is the Goplus 2-Ton Engine Hoist. An excellent engine lift at a superb price. Copyright © 2019. Winches-Direct.com. All rights reserved.